By Daniel Horowitz--Whoever coined the phrase, “youth is wasted on the young,” obviously never met Rachel Singer or Alana Kayfetz. Singer, a 29 year old Digital Media Strategist and Content Manager at Rogers Publishing, along with Kayfetz, also 29, who has worked in Toronto’s Jewish community for close to a decade and is currently the Director of Strategic Development at JUMP (Jewish Urban Meeting Place), have proven to be quite the dynamic duo in personally spearheading a grassroots movement to save the Canadian Jewish News from extinction. Upon reading an April 22 announcement from CJN President Donald Carr that spoke of the CJN’s demise and that it’s last issue would be in June, 2013, the tech-savvy pair, devastated by the news, quickly used social media to get the word out that we must do what we can to save the vital publication which, for 53 years, meant so much to so many across Canada. The women set up a website www.savethecjn.com which includes an online petition, along with a section where people could submit comments and ideas for saving the CJN. On April 24, just two days after the CJN’s announcement, they emailed a link to the site to a handful of friends, quickly going viral through social media, and gaining more than 60,000 views in just days, with over 3,600 petition signatures and more than 2,000 suggestions. 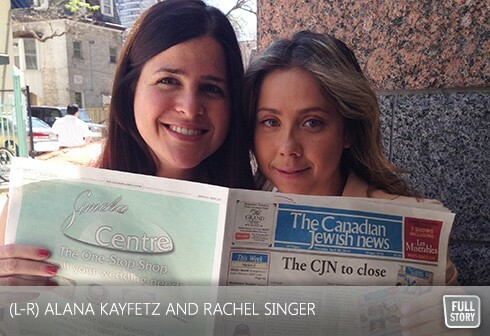 “The Canadian Jewish News is an essential source of information for many people in the community,” said Singer. And, demonstrating just how much can be accomplished by a pair of talented, passionate advocates, it appears that the efforts put forth by Singer and Kayfetz are paying dividends for the CJN and, by extension, Jewish Canada. “Currently the paper is in the initial stages of a rescue operation, and I believe that because Alana and I made so much noise about this cause in such a short time, that we were able to convince the powers that be that the Canadian Jewish News must continue operation,” said Singer. But, in this, the digital age, why would a pair of “under 30s” care so much about saving a paper that clearly wasn’t aimed at their age group. "The CJN, in its current format, is not inclusive to younger Jewish Canadians, but that doesn’t mean that it isn’t just as important a tool," explained Singer.